Posted with permission from daringopinion.com. Non-Arab Muslims in predominantly Sunni Bangladesh, Indonesia, Pakistan, and Turkey, representing two thirds of world Muslims, have a moderate and modern attitude towards Islamic dogma and Shari’a laws. They conduct democratic parliamentary elections and have had female prime ministers and presidents. By contrast, Sunni Arab countries treat women like chattel. For decades, Arab states have been ruled by non-representative dictators. Until the Arab Spring in 2011, the Arab peoples never had a democratic election, save for those farcical presidential referendums. Why the difference between the Sunni way of life of Arab and non-Arab Muslims? The answer may be found in the fact that Arab rulers and their palace ulama exploit those parts of the Islamic creed that help prolong their control over their people. Arabs consider themselves as the guardians of the “true” Islam of seventh century Arabia. That the Prophet, his companions, the Quran, and the sanctuaries in Mecca, Medina, and Jerusalem are all Arabic cement that belief. The Quran describes Arabs as the “best people evolved to mankind” (3:110). The Arab Spring has triggered big conflicts between Arab rulers and their palace ulama, on one hand, and the anti-ruler ulama and the masses, on the other. The palace ulama have been for decades actively protecting the excesses of their benefactor kings and presidents. They preach that blind obedience to the Muslim ruler is a form of Islamic piety, citing God’s word in the Quran (4:59): “Obey God and obey God’s messenger and obey those of authority among you”. The palace ulama teach that the Prophet Muhammad had reportedly said, according to canonical Hadith collection of al-Bukhari and of Muslim: “He who obeys me obeys God; he who disobeys me, disobeys God. He who obeys the ruler, obeys me; he who disobeys the ruler, disobeys me”. The anti-ruler ulama believe rebelling against an impious or unjust Muslim ruler to be an Islamic duty. To justify their belief, anti-ruler ulama invoke the words of the Prophet, quoted in Abi Dawood, Muslim, and al-Nasai: “Whoever of you sees an evil action, let him change it with his hand; and if he is not able to do so, then with his tongue; and if he is not able to do so, then with his heart”. The anti-ruler ulama helped to remove from office in 2011 the rulers of Tunisia, Egypt, Libya, and Yemen. Anti-ruler Islamic groups performed impressively in all of the democratically held parliamentary elections during the last quarter of the year. In Tunisia, al-Nahda Party achieved 41% of the vote. In Morocco, the Justice and Development Party achieved 27% of the votes, more than any other party. 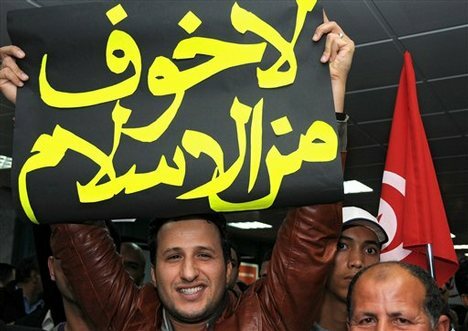 In Tunisia and Morocco, the leaders of the winning parties became prime ministers. In Egypt, Islamic politicians will undoubtedly form the next cabinet when parliamentary elections are completed in early 2012. Already, in the first round, the Freedom and Justice Party, a reincarnation of the Muslim Brothers organization, achieved 37% of the votes and the fundamentalist al-Nour party achieved 24%. Likewise, anti-ruler ulama and Islamic parties are most likely to perform well in the forthcoming parliamentary elections in Yemen and Libya, and in Syria, too, whenever the Asad family finally falls. The victorious anti-ruler ulama in Tunisia, Egypt, Libya, and Yemen will undoubtedly provide the intellectual vigor and inspiration to the anti-ruler ulama in other Arab republics and monarchies to rise against their own unjust and corrupt presidents and kings. Within the ranks of the winning Islamic groups there are shades of moderation and extremism. The moderates; like Morocco’s Justice and Development, Tunisia’s al-Nahda, and Egypt’s Freedom and Justice might prove to be akin to Turkey’s Justice and Development Party, if they translate their electioneering pledges into action—time will tell. Fundamentalist parties like Egypt’s al-Nour, are Islamist salafis who find their guidance in Wahhabi extremism. Their members aspire to emulate the Prophet’s seventh century way of life in the Arabian Desert. Some salafis, for example, refrain from using spoons or forks because such implements did not exist during the Prophet’s life. Islamist salafis choose to focus on the intolerant and the violent parts of the Quran and the Sunna, to the exclusion of the tolerant and peaceful parts on the same issues. Wahhabism is influenced by the teaching of Ahmad Bin Hanbal (d. 855), founder of the most orthodox among the four surviving Sunni Schools of Jurisprudence. Less than 5% of world’s Sunnis today follow Wahhabi tenets, mainly in Saudi Arabia plus those among the millions of expatriate workers who became indoctrinated in the Wahhabi creed as a result of working in Saudi Arabia over the past 35 years. During the struggle against their tormentors, Islamic and Islamist parties were united. However, now that the dictators are gone from a few Arab capitals and leaders of moderate Islamic political parties took their place the next confrontation will be between the new religiously moderate rulers and the Islamist salafis. The Islamist salafis will attack the policies and laws of the new rulers as insufficiently Islamic, even heretical (kuffar) deserving death. The new rulers will defend their policies and laws as perfectly Islamic, supported by legitimating reasoning drawn from the Quran and the Sunna of the Prophet. The coming battle will engulf the moderates and the Islamists over the soul of Islam. The battle will be fought over whether Islam is going to be the intolerant violent religion of the Bin Laden Wahhabi type; or, the enlightened moderate and modern Islam of the Recep Tayyip Erdogan Turkish type? In the ensuing fight, the Islamist salafis will most likely be sidelined. The results of the recent parliamentary elections in Tunisia, Morocco, and Egypt point in the direction of a victory for the moderates. Most importantly, however, this battle might finally give birth to a reformation movement in Islam after a thousand years of suppression of innovation and persecution of whoever dares to think outside ancient and rigid religious constructions and dogma. The battle might very well produce an Islamic reformation movement similar to Martin Luther’s sixteenth century reformation of Christianity. If that happens, the world will become a safer place. Should Washington and the West fear moderate Arab Islamic regimes? The answer is no. Why? Because to be Islamic need not be anti-America or anti-West. Wahhabi Saudi Arabia, the world’s most Islamist regime has been obsequious to U.S. policies and interests. Islamic rule will not necessarily be more Islamic than the current Arab regimes. Already, in all Arab countries, Islam is the religion of the state (in Syria, Islam is the religion of the president) and Shari’a is either the source of law or a main source of law. Consider, for example, the so-called “secular” regime in Damascus. Although the Asad clan, apologists, and propagandists constantly propagate that theirs is a “secular” regime, evidence shows otherwise. In fact, the Syria of 2011 is more Islamic than the Syria of 1963, when Hafiz Asad and his five compatriots put an end to the rule of Syria’s last legitimate parliament and President Nazem al-Qudsi’s cabinet. In Mr. Asad’s “secular” Syria today seventh century Shari’a laws and courts control personal status, family, and inheritance affairs (Christians follow their own archaic religious courts). Shari’a law is the antithesis of the liberal laws of the modern age. It denies women human and legal rights compared with Muslim men. Shari’a law reduces the status of women to that of chattel—a Muslim man can marry four wives, divorce any one of them without giving reason, with limited child custody rights, housing, or alimony; a Muslim woman is prohibited from marrying a non-Muslim man while the Muslim man is allowed to marry non-Muslim women; a woman cannot pass her nationality on to her foreign husband and children while the man can; “honour killing” of a woman by a male relative results in a light sentence for murder; and two women equal one man in legal testimony, witness, and inheritance. Such maltreatment of one half of society is in spite of the regime’s energetic attempts to project an image of secularism, modernity, and equality between the genders. More mosques, bigger congregations, and more veiled women than ever before have become the order of the day in Syrian cities. To flaunt his Islamic credentials, Mr. Asad even ordered a special rain prayer throughout Syria's mosques performed on December 10, 2010 to ask God to send rain. With such credentials, it is difficult to see how a moderate Muslim Brothers rule in Syria would be more Islamic than the Asad regime.